Church. What a concept! There are two simple questions I believe every congregation should take some time to seriously consider: 1) what is “church,” and, 2) what is church “for”? We assume we know what church is, but much of what we think and believe is nothing more than validation of our own personal wants and desires — church is what we make it. And often what we make it is a mess. Blog-buddy Taylor Burton-Edwards and I go round and round over what the church is and has been versus what it could (and should?) be. At the heart of our discourse is the fundamental purpose question — why does the church exist? I am unabashedly on the side of “the church does not exist for its own benefit” camp. My vision of “church” is the body of Christ — individuals who are bonded together to be more than the sum of their parts and equipped, empowered, and employed in being Christ for the world. I realize that this is a minority view — I get hammered all the time for trying to make church “too hard.” But I am not trying to make it too hard. I am trying to make it authentic. I have never said (though I have been accused) that everyone in the church has to BE Jesus — that we should hold everyone to an impossibly high standard of conduct, belief and practice. I do believe that in Christian community all people should strive for their fullest potential, and that the reason the church exists is to challenge, coach, and create authentic discipleship and stewardship. I believe that church is the proving ground for Christian discipleship — that it shouldn’t be “easy” or “comfortable.” We don’t go to the gym because it is easy or comfortable — we go to be conditioned, to sweat, to work hard to improve our physical fitness. This, for me, is what the church should be. Yes, certainly, it should be a place we can turn in time of need or anxiety, tragedy or despair. We should be able to be comforted as well as challenged, but there should be balance. Many people feel the church should do nothing but care for their needs and desires. Many feel the church should not have a social or political voice, that it should not be involved in human rights or justice issues, that it should mind its own business and simply care for the congregation. I can’t go there. The church is not a social service organization. It is a witness to love, joy, peace, patience, kindness, generosity, faithfulness, gentleness, self-control, mercy, justice and humility. There is no body of Christ that is not deeply and passionately involved in the critical issues of our time. There is a bell curve in any Christian community — a tail of those new to the faith or less mature in their spiritual development. We don’t demand much of the newcomer — they are in full “sponge-mode,” soaking up as much as they can — learning, discovering, wrestling, applying, studying, experimenting. The church exists to nurture these people — but nurture them toward the other end of the spectrum. That other end is composed of those who are deeply committed to the life of Christian discipleship and stewardship — learning and doing in an ever-increasing loop and flow. They are the ministers of the gospel at their best — the body of Christ for the world, taking their faith into their daily lives and witnessing to Christ in thought, word, and deed. They are the “gold standard” by which a congregation will be judged. They are the mentors and guides that pull the whole congregation forward in faith development and spiritual formation. These two “tails” — the less mature at one end, the more fully mature at the other — bookend a rather large and imposing middle. The middle — that large mass of people who make up the majority of our congregations — defines us. It is either a moving mass, growing toward maturity and full expression in the body of Christ, or it is a complacent lump seeking to be served rather than to serve. The middle is defined by one of two driving motivations: continuous improvement or consumerism. 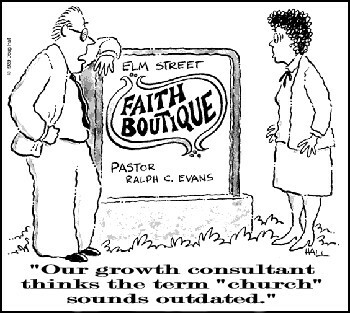 On the continuous improvement side you have people dedicated to growing in their faith. As people grow in their faith, they grow in their awareness and understanding of God’s will. Their focus shifts from what they can get to what they have to give. The position of the congregation shifts from personal need to the common good. First, the shift helps people put the needs of the congregation before their own personal needs and desires; then the shift produces a commitment to serve the world rather than the church. The consumeristic vision is significantly different. There is little or no desire in the consumeristic vision to continue growing. Church isn’t something to “become,” but merely a place “to go.” An hour on Sunday morning (or Saturday) night is sufficient. Five bucks in the collection plate is an adequate “fee” to pay for the experience. And as long as nothing more interesting is happening, we’ll probably show up (but heaven help us if we go past noon during the pro football season…). Sunday school? No, we did that when we were kids — we don’t need it any more. Serve on a committee? We’d rather not, thanks. Work with the youth? What are we paying the youth pastor for? In a survey done for The United Methodist Church in 2003, 61% of active UMs saw no reason why they should be expected to do anything in the church beyond showing up for worship. From that same survey project it became clear that most pastors do little or nothing to challenge this mindset for fear of “losing” these members to other churches — though why they would want to keep them was a question we never really explored. For the past century or so, the focus of church growth has been on the consumeristic middle, not either “tail.” Keeping the middle happy drains the majority of our resources and holds our churches firmly in place. It is important to note that our “place” is not a stable position, but a steady slide toward extinction. Our commitment to mediocrity is killing us incrementally. We haven’t been headed anywhere positive for a long, long time. We gave up traveling toward a Promised Land for wandering in the wilderness a couple of generations back. But so what? Taking a broad view, we are a part of a long-standing, natural evolutionary church process: enthusiastic movement away from the status quo, energy and vision define identity, deep commitment and engagement, organization and institutionalization, development of new status quo, cementing of the institution, loss of energy, loss of enthusiasm, loss of engagement — to everything there is a season; to everything a purpose under heaven. We are trying desperately to hold onto something we haven’t been for a long, long time. There is a groundswell of United Methodists hungering for something better, something more. But we cannot wait for the entire denomination to embrace such a vision. The denomination is committed to institutional preservation not spiritual transformation. The enlightenment that is calling more and more Christians to the leading edge of the bell curve — authentic discipleship and stewardship — isn’t coming from within the mainline. Authentic discipleship and stewardship scares the daylights out of the mainline. Holding people accountable to basic Christian principles of witness and service would mean that we would lose a majority of the consumeristic middle, and we can’t have that. They possess too much of the money we depend on to build and maintain huge buildings and pay staff salaries. We just can’t afford to lose more members than we already are and continue to prop up the denomination. But there is hope. There ARE churches pursuing a missional vision that hold participants accountable to Christian growth and development. There are congregations that place as high a premium on service and witness as worship and fellowship. There are leaders who understand that they are not mere shepherds (pastors) but mentors and guides and teachers. We have clergy and laity that are dedicated to making “church” mean something — to distinguish “church” from clubs, coalitions, and social services. In every age, in every place, new life, new energy, and new purpose emerges. These congregations have revisited the questions “what is church?” and “what is church for?” and have come up with very similar answers. We are the church, together the body of Christ, empowered by God’s Spirit to do the work of Christ in the world. Simple, elegant, transformative. Categories: Christian discipleship, Christian witness, Church Leadership, Core Values, Mission of the Church, Religion in the U.S.
No “going round and round” here at all. We’re on the same page. And you’ve said it beautifully. Where is the line between small steps in the right direction and paradigm shifting change? A congregation long in the rut of consumerism, can it change slowly by degrees or does it need to be shaken by a mighty jolt? Is a pastor who sees small change and lets that encourage him allowing inches to take the place of yards and miles? 3. be clear about impact — these are the things we measure to judge effectiveness — lives touched, needs served, participants actively engaged in ministry, those graduating to teaching/leading/menoring, etc. 4. strong balance of discipleship/stewardship, inward/outward, hearing/doing, following/leading — everyone is on a growth path whether it be at a novice, intermediate, advanced or mastery level. One of my favorite metaphors (given to me from a lay leader in Ohio) is that of “tightening the bolts.” He explained that his church wasn’t broken, just loose. They got a little bit more serious about spiritual disciplines, fellowship and community service. Then they got a little more serious. Then a little more serious — raising the bar every few years. At the end of a decade, almost the entire congregation was involved in hands-on ministry of some sort, and while the membership hadn’t increased significantly, the number of people benefitting from the congregation’s ministries went from about 50 to over 500. For this leader, the most significant decision made was to give most of the time and energy to the most highly motivated instead of coddling the least. Even at this, it is much more art than science, and I think each individual context requires some customization.